Composed for the Thirteenth Sunday after Trinity, which fell on September 3, 1724, Bach's Cantata No. 33 "Allein zu dir, Herr Jesu Christ" (Alone in You, Lord Jesus Christ) (BWV 33) sets a three-verse chorale by Konrad Hubert from 1540 with the first and last verse forming the opening and closing chorales and the central verse elaborated into a pair of recitatives and arias by an unknown poet. The cantata is scored for bass, alto, and tenor soloists, chorus, a pair of oboes, strings, and basso continuo. 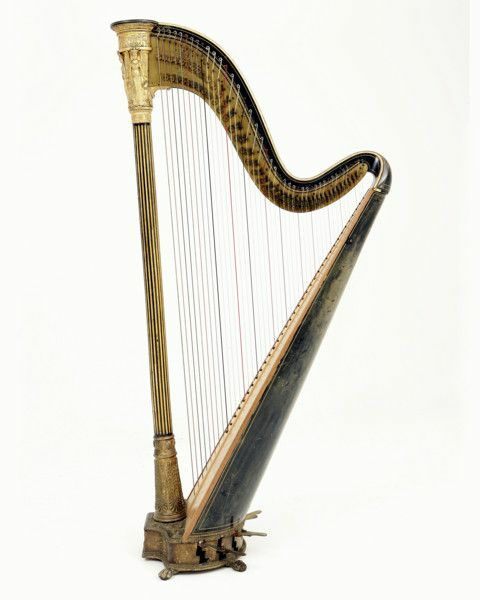 The cantata is in darkly glittering A minor, with its first movement in the tonic, its second movement in the dominant minor of E minor, its third in the relative major of C major but with a pronounced inclination to turn toward A minor, its fourth back in the tonic of A minor, its fifth in E minor, and its sixth is again in A minor, but with a picardy third in the final bar. Thus the work's harmonic structure forms an arch around the third movement: A minor -- E minor -- C major -- A minor -- E minor -- A minor. The first movement is a typical opening movement for a Bach cantata with the full orchestra having the main musical argument and the chorale melody interjected phrase by phrase by the choral sopranos with the lower choral voices elaborating on the chorale hymn. The second movement is secco reiterative for bass soloist and continuo blossoming into a brief Arioso in its final bars. 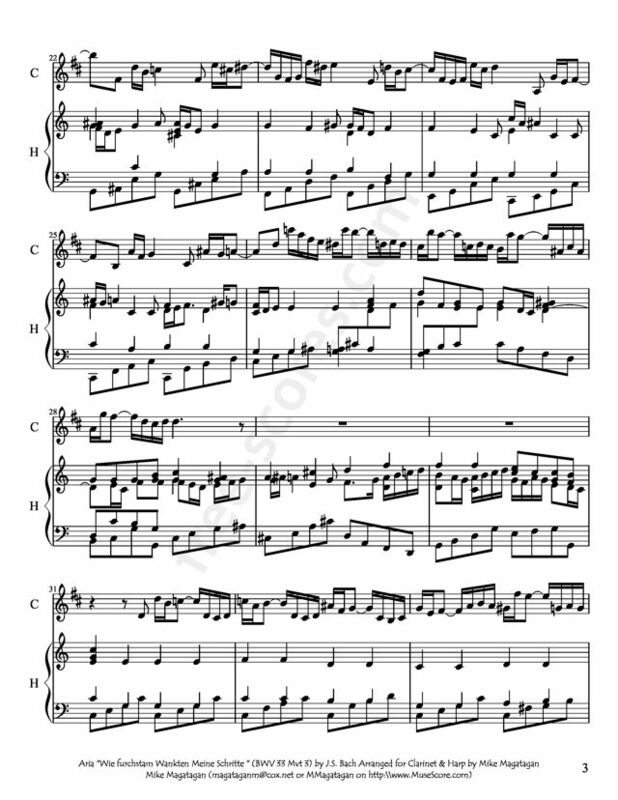 The third and longest movement is an extended da capo aria for alto soloist, with con sordino first violins and pizzicato lower strings and continuo. 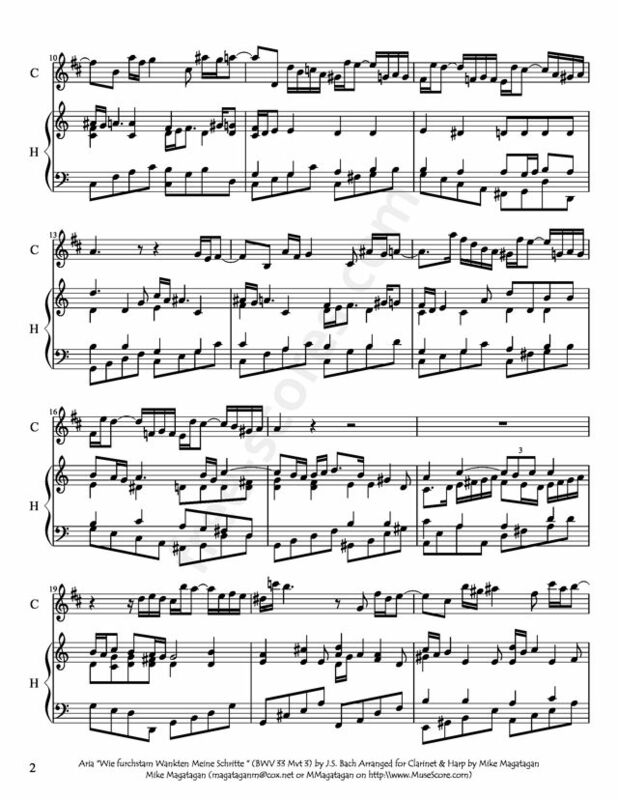 The fourth movement is a second secco recitative for tenor and continuo. The fifth movement is a duetto for tenor and bass soloists with obbligato oboes. "Allein zu dir, Herr Jesu Christ" closes with a powerful harmonization of the last verse of Hubert's chorale for the entire chorus and orchestra. 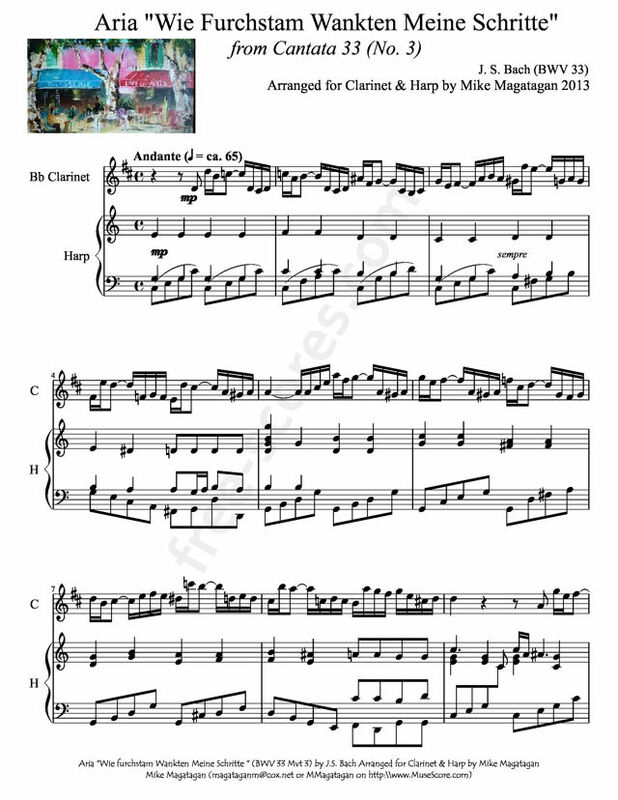 Although originally written for Chorus (SATB) and Orchestra, I created this unusual arrangement of the alto aria, movement 3, "Wie furchtsam wankten meine Schritte" (How fearful were my shaky steps), for Bb Clarinet & Concert (Pedal) Harp to play on my perception of the French Romantic "laissez-faire" that this piece speaks to me. As Bach did not live in this era, this is my interpretation only and is not based in actuality.